When you add a modern page to a site, you can add and customize web parts, which are the building blocks of your page. Use the Text web part to add paragraphs to your page. Formatting options like styles, bullets, indentations, highlighting, and links are available. Click + and then choose Text from the list of web parts. Click inside the box and the formatting toolbar will display. Enter your text, and format it using the formatting toolbar. To open or close the Text and table formatting pane, click the ellipses (...) on the right side on the toolbar. Click Hyperlink in the toolbar or in the Text and table formatting pane, or use CTRL+K. If you select a word before clicking, that word is used as a keyword to search for pages. 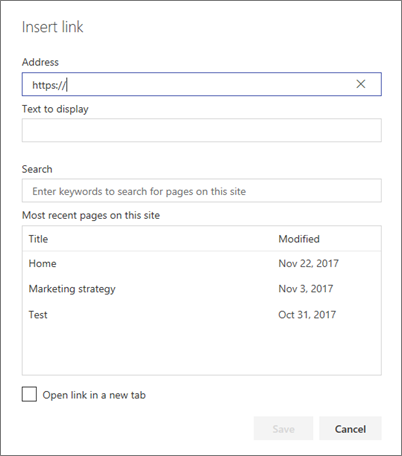 In the Insert Link dialog box, type the address of the link in the Address box, and the text you want linked in the Text to display box. Optionally, if you want to link to a page on the site, you can search for it using the Search box, and then select the page in the results list. 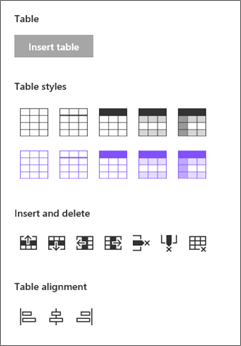 Click the Insert table button in the Text and table formatting pane. A simple table of 3 columns and 3 rows is inserted. You can format the text in the table by using the text formatting tools available on the toolbar or in the Text and table formatting pane. 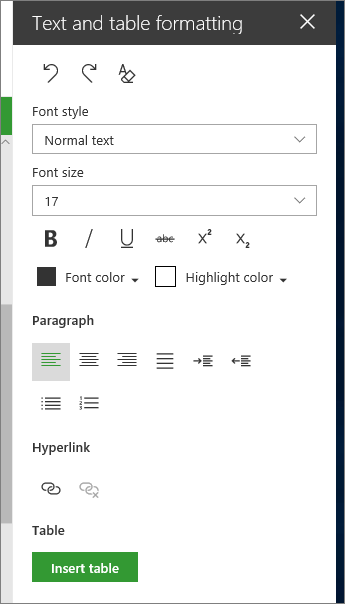 In SharePoint Online (but not SharePoint Server 2019), you can use the table alignment buttons to position the entire table within the web part space. You can align the table to the left, center, or right.